I love St. Paddy’s day…I love Corn Beef (actually Corn Elk Beef is far better) but I love the mood. This week it is on Monday so I thought I would do a little Pre funk St. Paddy’s day celebration. My wife ran the Shamrock run in the morning and I knew she would be hungry as she always is after a 15k so I knew she would be craving two things….Carbs and red meat. I have marinaded a lot of game with Guinness beer and this would work great with any red meat wild game. 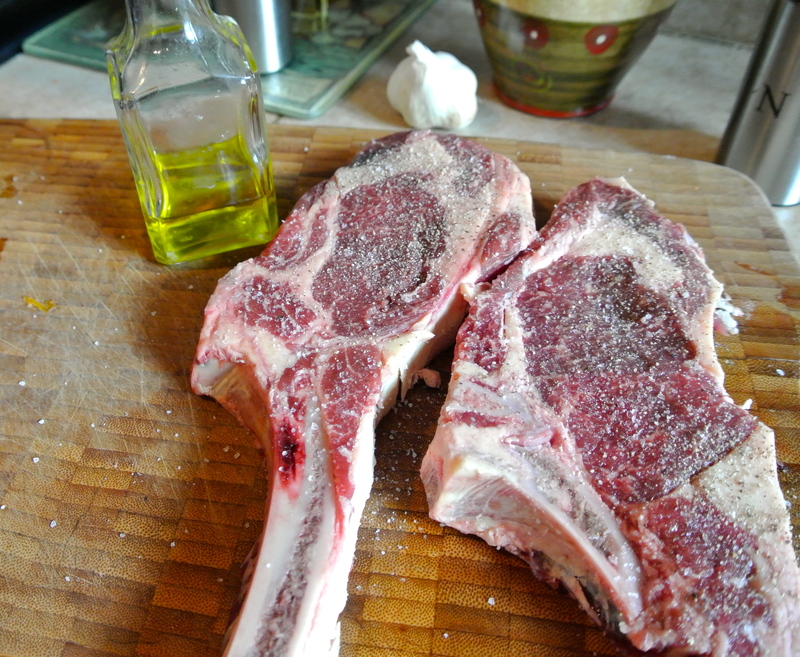 Salt and pepper the Bison Ribeye cuts. 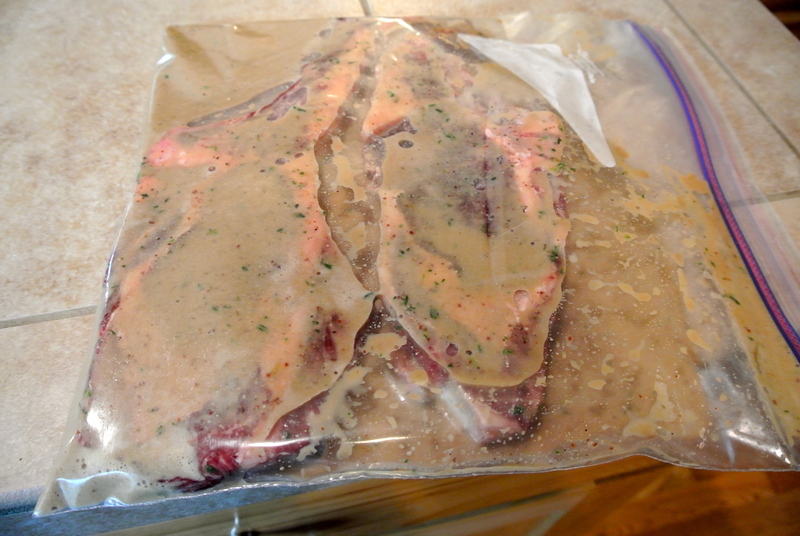 I use a nice large gallon ziplock to marinade the meat for 2 hours, however, if you were using Venison I would do over 6 hours to overnight. Flip every 30 minutes for 2 hours. While the Bison rest, it is time to make the pasta. I have blogged about how to make fresh pasta. Search Fresh hand cut pasta on my sight and you will find the recipe that will change your life. 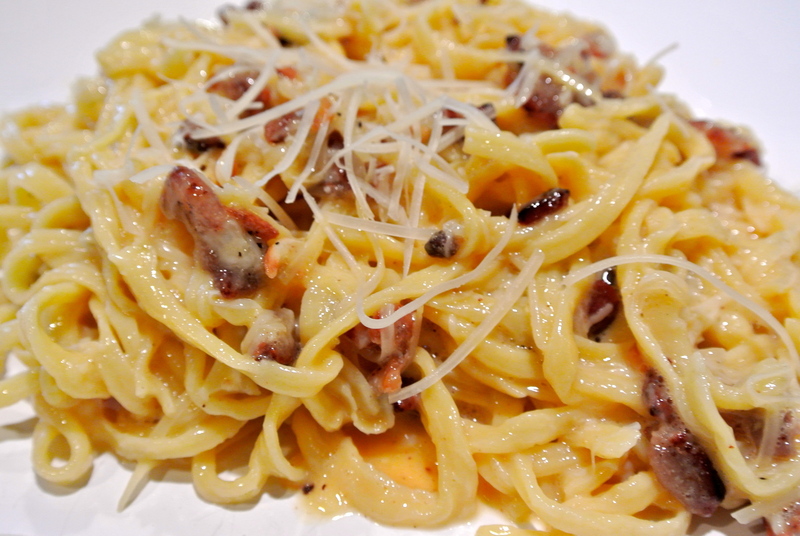 I love Italian food, I love Italy and I have had the best Carbonara Pasta dish in the world, and I have been trying to duplicate it for years. This is so far my best attempt. 1/2 pound of thick bacon or butcher cut pancetta. Do not use cheap American thin cut bacon! Heat olive oil in pan and add the bacon or pancetta, and cook slowly until brown. Remove bacon with a slotted spoon and add garlic and cook until brown, remove and add to bowl with manchego or half of the parmesan cheese and mix. 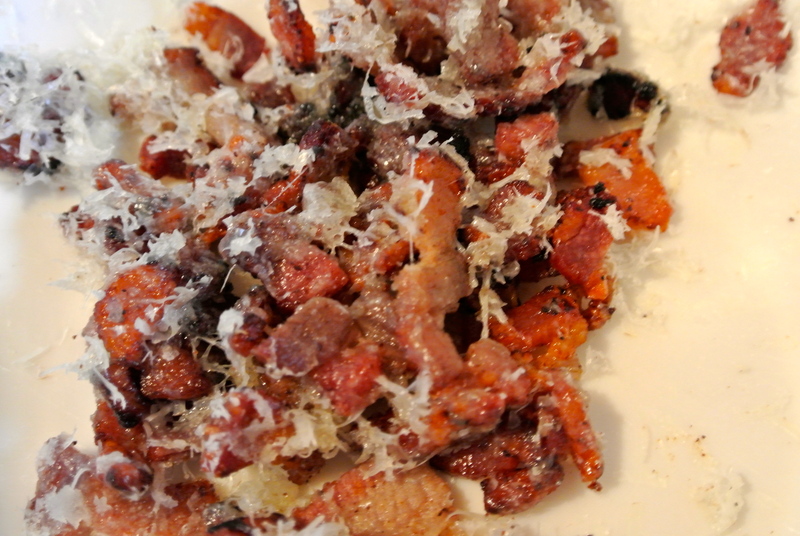 Mix thick cut bacon with manchego cheese. Heat water to a boil, and add salt. Add fresh pasta and cook for five minutes. Whisk eggs in a small bowl. 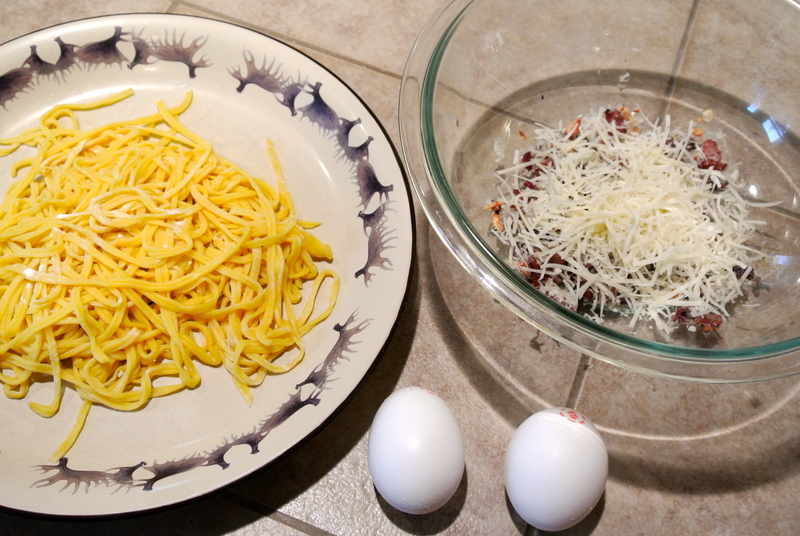 Once the pasta is done, drain and add to the bowl of bacon and cheese. Instantly poor eggs into the dish with bacon and cheese. Take a fork and whisk together adding remaing 1/2 cup of cheese. This dish is one that is to be served immediately so hit with a little sea salt and serve immediately because this dish needs warmth. 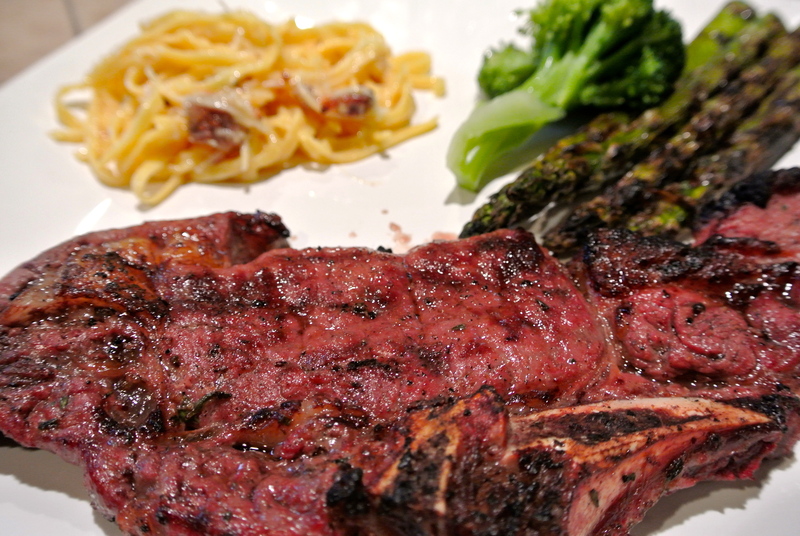 I pull my steaks and let sit, then finish the pasta although my recipe does not show that in sequence. If you just made the pasta you would be a superhero in most households. Simple, but has lots of dimensional flavor. This is what I love about Italy. The bison steaks were put on high heat 10 minutes before. When cooking any ribeye direct high flame heat is good. 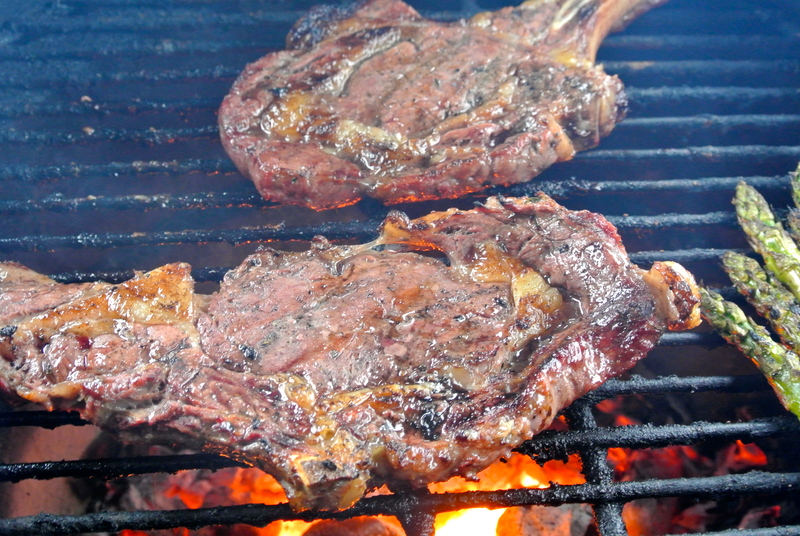 What is important is that you keep an eye on the bbq so you do not totally burn your steaks, but do not panic when the flame is hitting your ribeye, it is okay, just be calm. 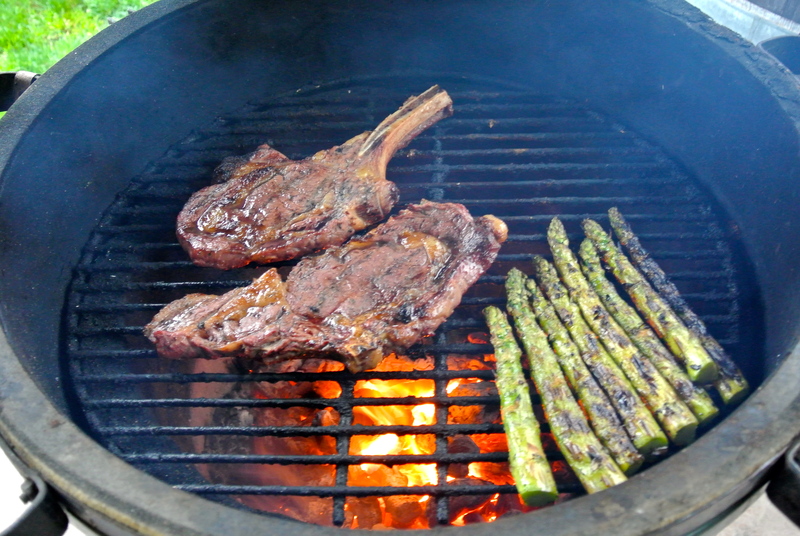 Direct flame is excellent for ribeye cut. Keep in mind, the difference between beef and bison is about 50% cooking time, bison cooks faster and needs to be served medium rare, then let sit off the grill on a plate for 5 minutes to bring to medium. Flame is excellent for cooking bison, flash flame heat. I put on Asaparagus that has white truffle oil and salt and pepper over the vegetables. Irish Guineness Bison and fresh pasta is plated with veggies. What a great dinner, there is nothing like sitting down with the family and enjoying a great meal.  This had everything that my family lineage has in it’s blood. A little Irish, a little Itlalian and a lot of American. Have a great St. Paddy’s day everyone. I hope you enjoy the day. What a fine meal for a fine day.